Watch out! 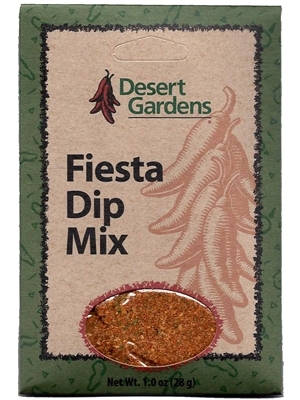 Desert Gardens Fiesta Dip Mix is addictive! One package makes 16 oz. of delicious dip when added to sour cream and a little mayonnaise. Versatile, too! Use our dip to add some Southwestern zip to your favorite recipe...mix any leftover dip with prepared pasta, cooked chicken or shrimp and serve...a fabulous pasta dish, Fiesta style! Add dip mix to sour cream and mayonnaise and chill for 30 minutes. For salsa, add to 32 ounces of tomatoes and blend. Try stirring prepared dip into cooked fettuccine for a creamy Southwestern pasta dish. Onion, crushed red pepper, salt, garlic, parsley, spices and sugar. Manufactured in a facility that also processes Milk, Egg, Soybean, Wheat and Anchovy. ​Fiesta Vegetable/Chip Dip: Mix 1 package Fiesta Dip mix to 1 1/2 cups sour cream and 1/2 cup mayonnaise. Refrigerate two hours before serving. Fiesta Queso Dip: Mix 1 package Fiesta Dip Mix with 1 1/2 pounds melted American Cheese. Thin with milk. Fiesta Fettuccini: Mix 1 package Fiesta Dip Mix with 1 1/2 cups mayonnaise. Refrigerate 1 hour. Add to cooked fettuccine (or your favorite pasta). Fiesta Shrimp Fettuccini: Saute desired quantity of shrimp in butter and sprinkle with Fiesta Dip Mix from package. Toss and serve over Fiesta Fettuccine. Fiesta Salsa: Add 2 tablespoons of Fiesta Dip Mix to one 12-16 ounce can of diced tomatoes. Briefly mix in blender. Refrigerate 1 hour. Substitutions: Lite sour cream or plain yogurt may be substituted for sour cream or mayonnaise in any Desert Gardens dip.